This section shows the details of the activated certificate for Zevenet Enterprise Edition. Not Before. Date and time when the certificate was issued. Not After. Date and time until the certificate is valid. Note that after this date the appliance will continue working perfectly if it’s more or equal than 1 year, only a warning will appear. Less than 1 year is considered as temporary activation certificate and the appliance will stop after this date and time. O. Organization that the activation certificate has been issued to. OU. Key generated by the appliance instance and used in activation certificate. CN. Host name in case sensitive followed by the email of the requester. Upload Certificate. This option applies a new activation certificate (temporary and definitive ones). Once this option is selected there will be available the option Select file where we can select a certificate from our local PC to be uploaded to the load balancer. Click on Upload to apply the new activation certificate. Delete Certificate. Unset and remove the activation certificate from the appliance. In the case that you require an evaluation certificate, please fill in the Request Evaluation Form. Once you send the form you will receive an automatic email with the steps for activating an evaluation of Zevenet Enterprise Edition. 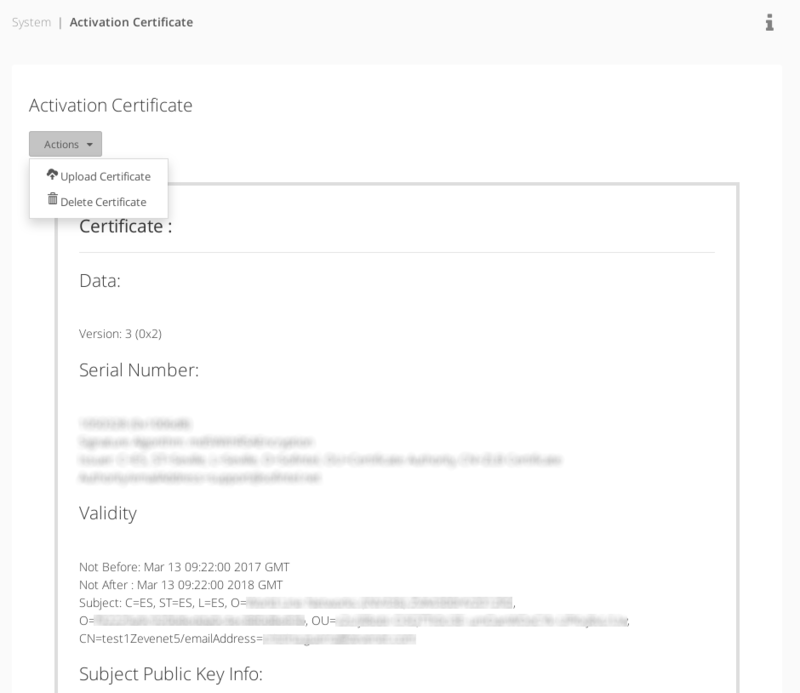 These certificates are issued with a default period of 1 month and they are deployed for testing purposes, by the other hand if you require a definitive activation certificate please contact with us through the Contact us form.